This tutorial describes how to generate new random preset for a VST Plugin using the VST Preset Generator. 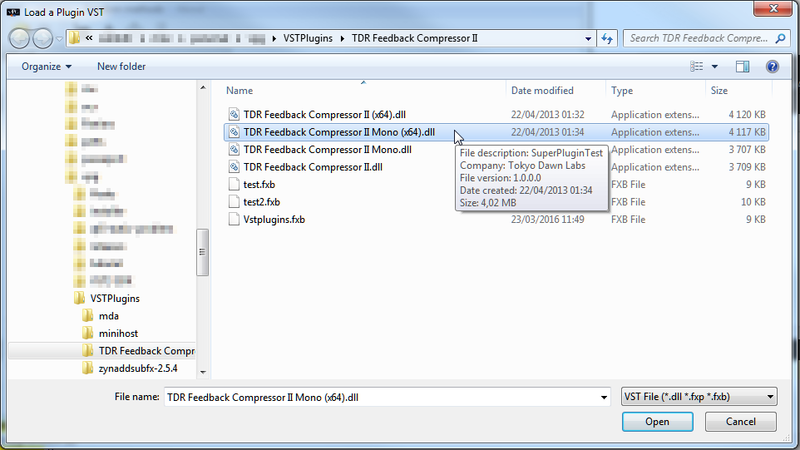 The VST plugin we will use in this tutorial is TDR Feedback Compressor II from Tokyo Dawn labs. 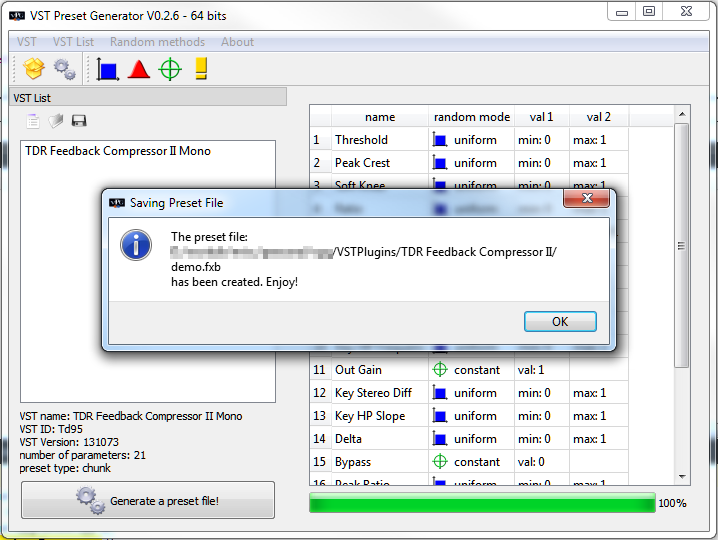 The first step is to load the plugin in the VST Preset Generator. 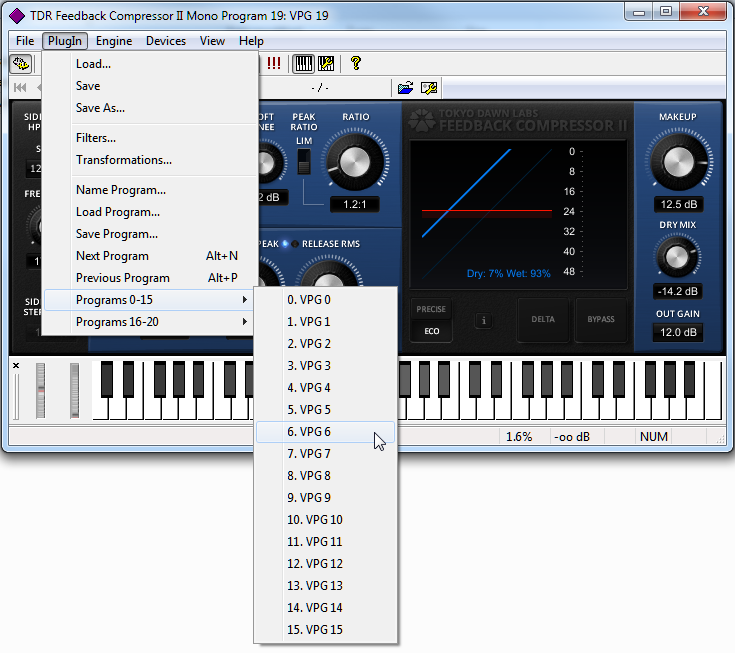 Use the yellow box icon to import informations about your VST plugin. Select the .dll file of your plugin in the Open Dialog. 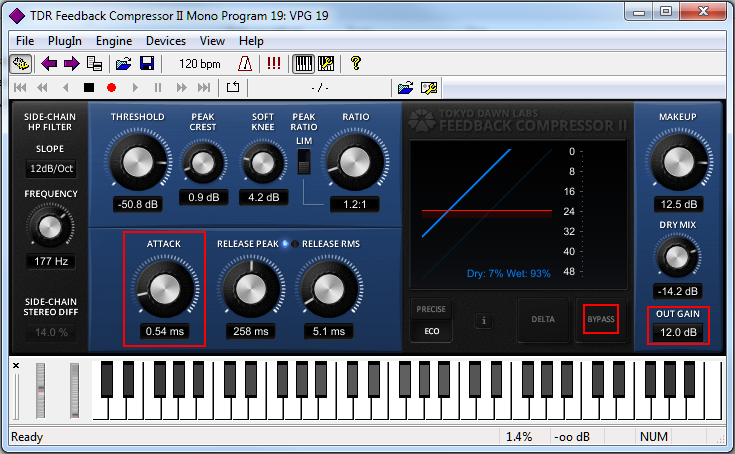 Once the plugin is loaded, the parameters are shown in the right panel. 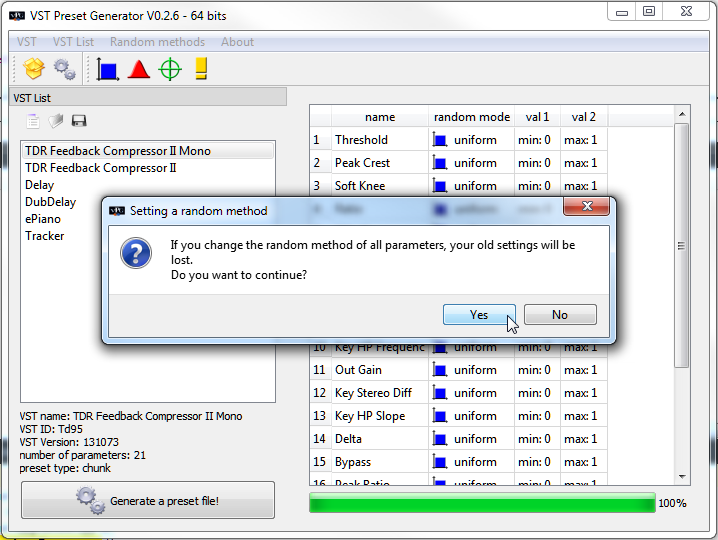 For each parameter the random method defines the way the value will be generated in the presets. constant: the generated parameter’s value will be fixed. normal: the generated parameter’s value will oscillate around a given value. 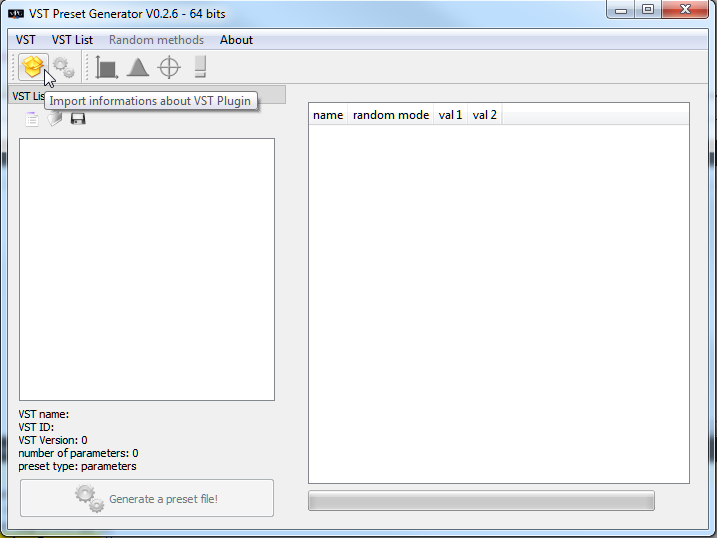 uniform: the generated parameter’s value will be picked randomly between two values. See the documentation for more informations about the random methods. A good way to start is to set the obvious parameters that won’t change as constant. For instance we don’t want to randomize output volume or bypass switch. Click on the random mode column of the row Out Gain and change the random method to constant. Click on the val 1 column of the Out Gain parameter and set the value to 1.00 as we always want full volume in the generated presets. Repeat the operations for the Bypass parameter, and set the value to 0.00 to deactivate bypass. In our case we want to generate preset with short attack. Click on the random mode column of the row Attack and change the random method to normal. Then set middle value to 0.1 and the deviation to 0.01. This will generate attack parameter values most likely between 0.99 and 0.101. Let the other parameters to default uniform value, it will generate random parameter’s values between 0 and 1. If you don’t know what random method to set, this is the most appropriate. Once you have set the random methods, it’s time to generate presets! Click on the big button on the bottom left to launch the generation process. The following window ask for either a program preset file (.fxp) or a bank preset file (.fxb). 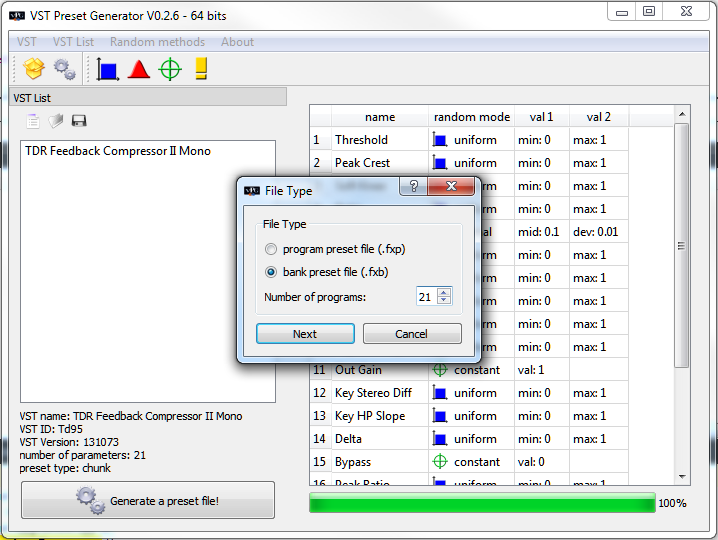 A bank simply contains many programs, whether program contains only one preset. If you choose to generate a bank you can adjust the number of program in your bank. The default value is the max number of program the plugin can handle. Click Next and select a file name for your preset. 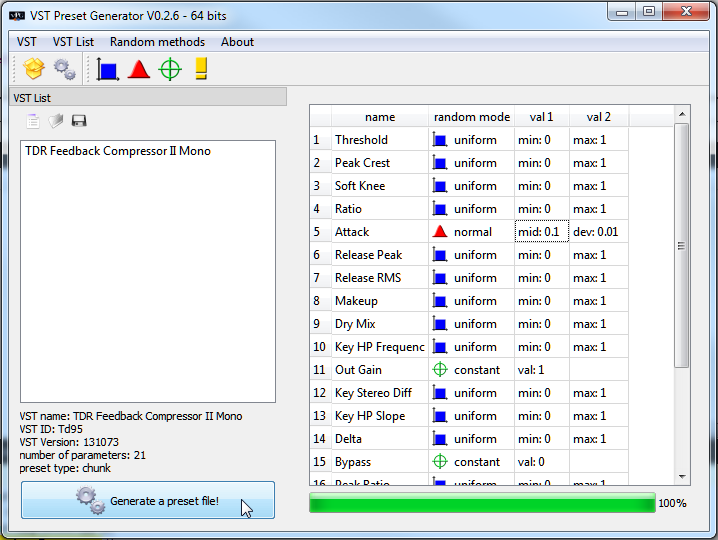 And you’ve generated a preset. Congratulation! The full file path is displayed in the popup. This is the file you will load in you VST host, so please remember it. You’ve generated a preset file, let’s open it in your host to check the new random sounds/effects you’ve created. In this tutorial the VST host is Savihost from Hermann Seib. 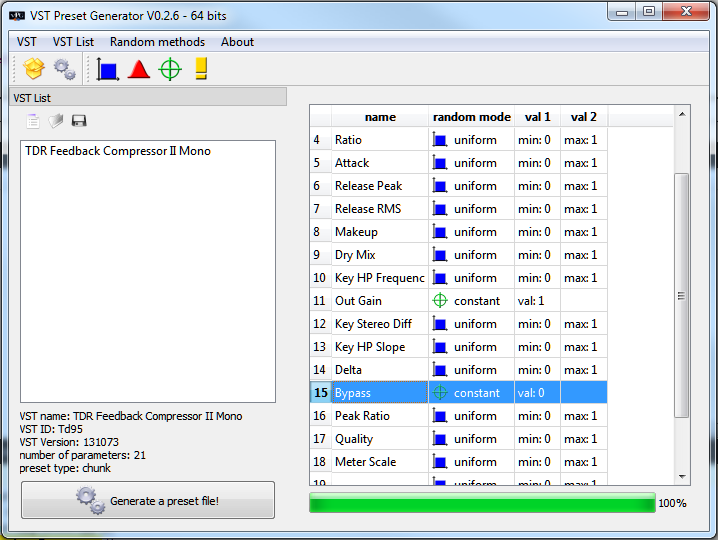 Once the plugin is loaded in the VST host, you can select the generated preset file (fxp or fxb). 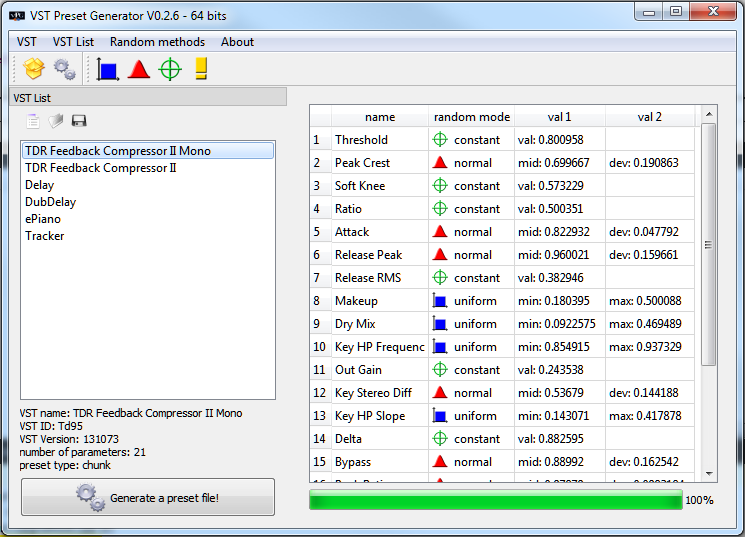 You can check that the volume parameter and the bypass parameter have constant values. The attack parameter’s values are oscillating around a short value, as expected! 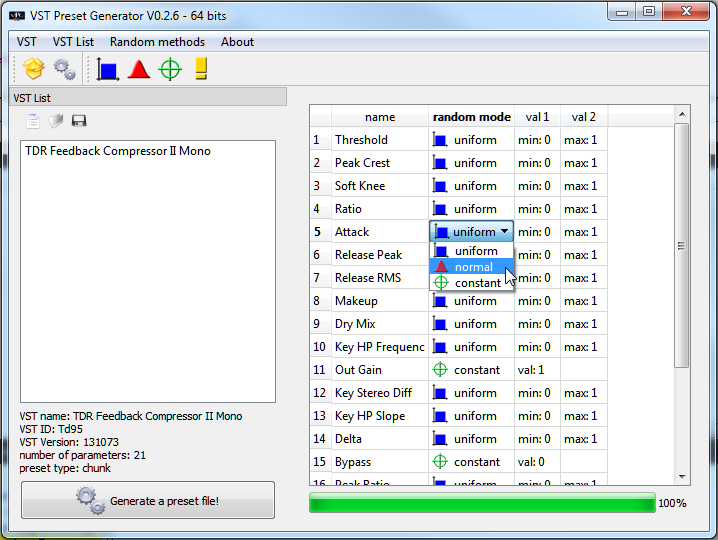 If you like experimentation you can play with the randomness in the VST Preset Generator. Use uniform random method to get full randomness on all parameters. 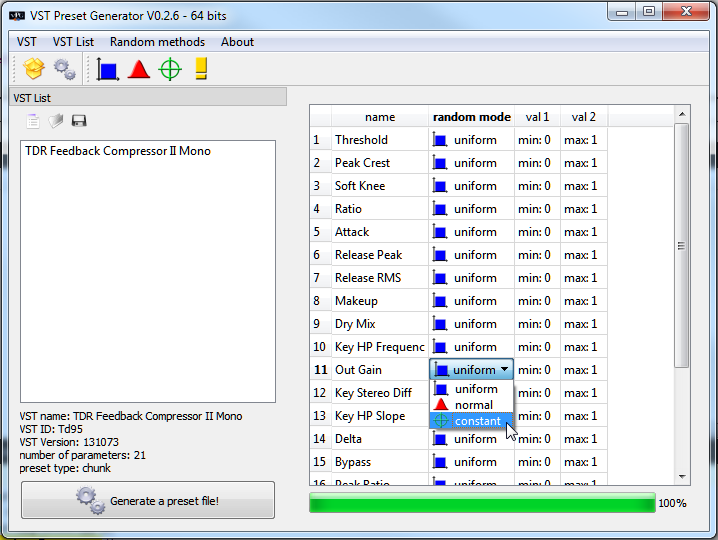 Use normal random method to create variations around a known preset. In this case the middle values must come from the originial preset. A warning prevents you to erase your previous values each time you use one of these buttons. Et voilà! Random method and values for your parameters. You can now generate the preset files. When you’ve loaded many plugins, you can manage your list with the buttons just above the plugin list. 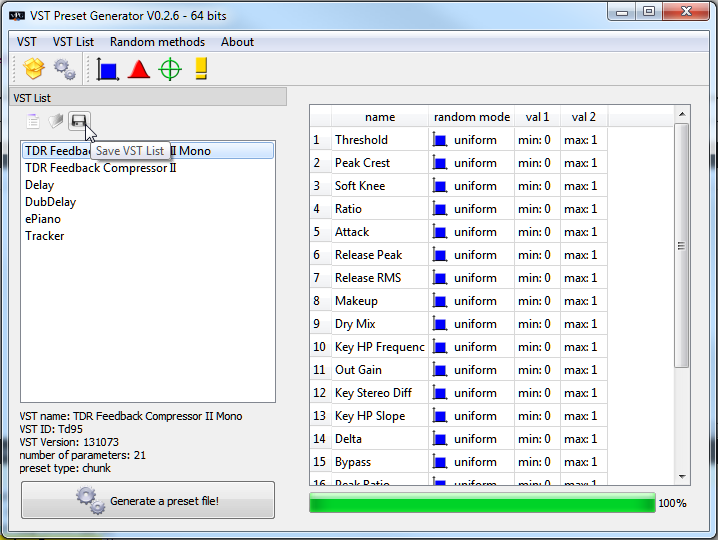 This let you save the list in a .vpg file that you can re-open in the next VST Preset Generator session. Thanks for reading this short tutorial!